A year ago I reviewed a 3-CD box with recordings by Nilla Pierrou (see review) and made it one of my Recordings of the Year. The music, some of it rarely heard, was recorded from live concerts or studio recordings preserved in radio archives. This new box also contains some music originally issued on commercial LPs. 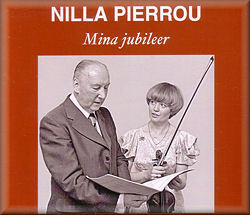 ‘My Jubilees’ is the title of the box, since Nilla in 2012 celebrated her 65th birthday, 50 years since she started her violin studies with Sven Karpe in Stockholm, 40 years since she got her diploma with André Gertler in Brussels. I praised her beautiful tone, her musicality and her technical brilliance when her first box appeared and I see no reason to change my verdict. There are also quite a few rarities here, even though there is more standard repertoire than before. The quality of the recordings is generally high, though the Bach A Major sonata on CD 1 is rather dim. This first disc is entirely devoted to the music of Johann Sebastian Bach and it makes an excellent start with a marvellous reading of the D Minor partita, which can be, and has been, a stumbling block for many a talented violinist. No such problems here. The playing is so assured, the tone glows with ardour and the concluding chaconne, with a playing time of 15½ minutes, leaves the listener breathless. The A Major sonata also goes well, though one wishes that Eugène De Canck had played harpsichord instead of a modern grand. When we reach the two violin concertos, some reservations begin to creep in. These are studio recordings and the technical quality is excellent; it goes almost without saying that the solo playing is on the highest possible level. The drawback is the orchestra. Oskarshamnsensemblen, as it was then, later renamed Camerata Roman and since 2004 Camerata Nordica, is rather heavy-footed. Speeds are generally slow and what we hear is lacking in the rhythmic exuberance of the best continental chamber orchestras – and I’m not talking of period instrument ensembles. The Cologne Chamber Orchestra, which I had at hand for comparison, is in a quite different league when it comes to lightness of touch. Heavy ritardandi also jar. It is a relief that the concluding Allegro assai of the E Major concerto has the dancing quality one was longing for. CDs 2 and 3 are entirely devoted to violin sonatas plus a couple of smaller pieces. Brahms’ sonata in A Major Op. 100 is arguably his very best chamber music work and the playing here is absolutely riveting. I was lucky to hear this sonata with Nilla at a concert in 2007, when she was on a farewell tour before her retirement. It is nice to find in the booklet notes an excerpt from Christer Eklund’s review of the same occasion; he is also the producer of this box. I can’t resist quoting it: ‘The performance of Brahms’ Violin Sonata in A major will remain in my memory. Moderate tempi, wonderfully long-spun bridges, deepest insight in a performance of highest international class – an exceptional experience of grace’ (Falu-Kuriren 18.9.2007). I couldn’t express it better myself. The music of the Belgian composer Albert Huybrechts (1899 – 1938) is rarely heard today. Besides a handful of orchestral works he composed chamber music and a number of songs. Very little seems to be recorded. On the Cyprès label there is a disc with three chamber music works, including the violin sonata, and another with his complete songs. The sonata is certainly fascinating, dissonant but full of thrilling ideas and it is rhythmically and dramatically captivating. This is music to return to. Not as often heard as the ‘Spring’ and ‘Kreutzer’ sonatas, the last of Beethoven’s ten sonatas is still a marvellous work, contemporaneous with the ‘Archduke’ trio. The sonata is rather idyllic. Nilla Pierrou plays it with lush tone but avoids sentimentality. CD 3 opens with a Swedish work, Bror Beckman’s Violin Sonata, written in the early 1890s before he became too involved in the administrative work that became his main occupation. He ended up as Director of the Conservatory of Music in Stockholm. The sonata is fresh and youthful, lively in the first movement with long melodic arches. The slow movement is also melodically attractive, beautiful without sentimentality. All-over this is remarkably mature music. As opposed to Grieg’s sonata there are no signs of folk influences. Neither are there in Emil Sjögren’s music. Sjögren was thirteen years Beckman’s senior but only the first two of his five sonatas for violin and piano were writtenbefore Beckman’s sole work in the genre. Considering this it is remarkable that Beckman in his Op. 1 produced a work that can be mentioned in the same breath as Grieg’s and Sjögren’s sonatas. Such inventive, well crafted and melodiously attractive music should be heard more frequently. We have to be grateful to Nilla Pierrou for opting for this reissue. It first came out in the early 1980s on a Caprice LP, coupled with Grieg’s better known Sonata No. 1. This is also the work of a young man – he was 22 – and it too is permeated with youthful exuberance. Grieg’s close bonds to Norwegian folk music is particularly in evidence in the second movement, even though formally it is a minuet with trio. In the final movement there are traces of folk song, skilfully ‘hidden’ in the fugato of the development. Technically this recording is superb. The Caprice label, which produced primarily Swedish art music including jazz and folk music since the late 1960s is now defunct but a lot of the material is still available as downloads from www.theclassicalshop.net. Schubert’s ‘Duo’ sonata in A Major was only published in 1851 but was composed when he was twenty. As in all the chamber works in this box Nilla Pierrou’s warm, beautiful tone and fluent bowing are ideally suited to the graceful melodies. This also goes for the second of Wilhelm Stenhammar’s Two Sentimental Romances from 1910. Among the best known and most loved Swedish compositions for violin they are commonly heard with orchestral accompaniment. Performed with piano, as here, the F Minor romance sounds very fresh indeed and in a way even more Nordic in tone. In the company of Kodály we travel to the little village of Kálló, north-east of Budapest. The dances of which Kodály wrote a version for four voices and a small orchestra in 1950, were arranged for violin and piano a few years later by Grigori Feighin. Sentiment, rhythms and virtuosity are central ingredients in this work. The flexible playing of Pierrou’s long-time collaborator Eugène De Canck should also be mentioned. They are really duo partners on equal terms. Lars Erik Larsson is probably best known, also in his native Sweden, for the Pastoral Suite and God in Disguise, both melodious and idyllic and written just before and at the beginning of World War 2. The Violin Concerto from 1952 is stylistically a far cry from those earlier works. Weak neo-classicism is supplanted by a kind of expressionism where influences from both Stravinsky and Bartók can be traced. André Gertler, who was a close friend of Bartók’s, collaborated with Larsson over the solo part and also wrote the important cadenza in the first movement. The second movement is marked Andante pastorale and has a prominent English horn solo. There are harsher winds blowing now in this one-time idyll, wasted through the intervening war. A momentary wash of Elysian strings soon gives way to the brass that dominate the fields where sheep are no longer safely grazing. The third movement opens Lento but after just a few bars it abruptly changes to Allegro molto. There are frequent tempo shifts and in the middle of the movement we are temporarily transported to a cathedral. In the main this is a rather carefree and virtuoso finale to a concerto that has established itself as one of the few important 20th century violin concertos. Rosenberg, Söderlundh and Linde could also be mentioned, all three written during the first half of the 1950s, and also Allan Pettersson’s monumental second concerto from 1980. Alban Berg’s concerto is generally regarded as the greatest 20th century violin concerto and it was also to be his swansong. Nilla Pierrou relates in her notes to this issue how this recording came about. In January 1978 someone from Westdeutscher Rundfunk phoned André Gertler and asked if he had a student who could replace a certain violinist in the Berg concerto two months later. Gertler said ‘Yes’, and then he asked Nilla to learn it. She had never heard it or seen the music before but she learnt it and played it, by heart at a concert in Frankfurt. It was recorded by Hessischen Rundfunk. When Pierrou prepared this box she found the recording – the quality of which is really good - in the archives. This was unfortunately the first and only time she had an opportunity to play the concerto. I wish more people could have heard her playing it. I have never heard the concluding Adagio played with greater warmth. In between these two concertos we hear her in Ysaÿe’s Chant d’hiver (Winter Song) from 1902. It is a late Romantic composition with lush orchestration filled with chromaticism. Not too wintry, at least from a Scandinavian perspective, which is understandable when we know it was written London. It is a delightful piece even so. Apart from some reservations concerning the Bach concertos I am full of praise for this issue. You won’t hear better violin playing anywhere. The repertoire is so attractive: from standard works (Bach, Brahms, Beethoven, Berg) to complete rarities. What is so gratifying is that all these recordings have been preserved and that the technical quality is so uniformly good. Production values are also high with a 44-page booklet, illustrated with numerous photos and facsimiles, valuable annotations on the music by producer Christer Eklund and personal reminiscences by Nilla Pierrou. A goldmine in every respect.